I first got diagnosed with breast cancer 13 years ago at age 31, then again at age 37 and finally it had spread to my lungs & liver in November 2009. Unfortunately, it is terminal this time. But not one for letting the grass grow under my feet, I decided I wanted to do all the things I’d always dreamed of doing but had never got round to, so I started creating a Bucket-List. 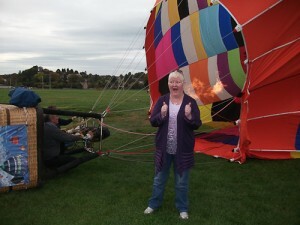 A hot air balloon ride was very high on this list and due to the kind generosity of “Challenge Cancer Through Adventure” I was able to fulfil that dream on a lovely sunny evening in September 2011. 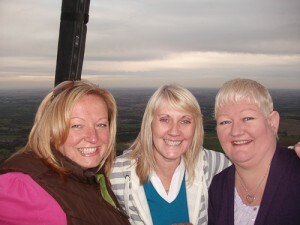 After 2 cancelled trips during a 2 week period due to weather, it was 3rd time lucky for my friends Amanda, Sue & I. 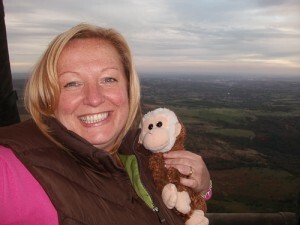 (Sue has also had breast cancer but is now in remission thankfully). Amanda is Sue’s younger sister and also my best friend, so it was wonderful for us to share such a brilliant treat and experience together. 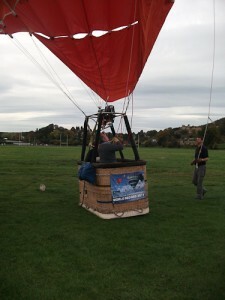 We arrived late due to traffic, at Bakewell Showground at 4.45pm, so the balloon was already being inflated by the Dragon Balloon team, the first thing I remember thinking was how big it was. Started taking photos and before we knew it, we were being given a Safety Briefing and told we would be taking off in a few minutes time. No time for the nerves to kick in because then came the most un-ladylike task of climbing into the basket, lol. Both take-off and flying was so so smooth. We were flying for approximately 1hr 15 mins, the time literally flew by. It was so very calm & peaceful up there. I felt at one with the world. Was quite emotional. It felt like we were hardly moving. 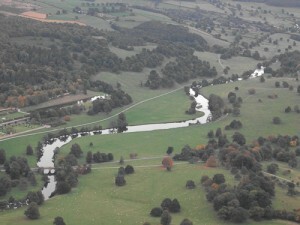 The views over Bakewell, Chatsworth, Baslow were stunning. To be so high up and in the open air was a truly amazing experience indeed 🙂 I’d recommend this to everyone, there’s nothing like it! We were met by a farmer, his sheepdog and a whole herd of nosey cows in the next field peering over the wall at us for absolutely ages, found that quite disconcerting for some reason, quite a weird sight. 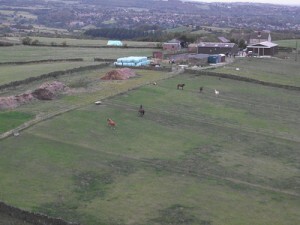 The Dragon Balloon team had tracked us from below and immediately arrived at the side of said field. 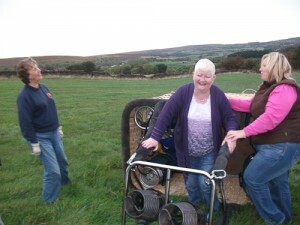 The basket & balloon were then duly packed away into the trailer and we were driven back to Bakewell, where Sarah from Challenge Cancer by Adventure was waiting for us. 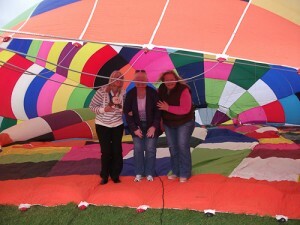 We’d already decided to save the champagne until we got back so it was lovely to share this with Sarah (from CCTA) whilst excitedly telling her all about our balloon flight. Thankyou thankyou thankyou from myself, Amanda & Sue to everyone at Challenge Cancer Through Adventure for all your help in making my dream come true. It was a truly unforgettable & fantastic experience. Loved every minute! Oh and I got a certificate too!